No need to shiver when we deliver! If you can imagine it we can make it happen. Bespoke sawn timber from our saw mill. Oak gateposts, garden sleepers, mantelpieces, lintels, joists...whatever you want we can deliver. Premium quality. Best prices. Delivered FREE in 20 mile radius of our premises. Optimum burning logs, seasoned, kiln dried and moisture tested. Registered supplier of biomass fuel which meets the governments eligibility requirements for the Renewable Heat Incentive. Phone us to pay for your order by debit or credit card. Phone our office 01388834100 or call into the yard. Seasoned, kiln dried and moisture tested. The moisture content on all logs is below 20%. Kiln drying takes place on our own premises and logs are constantly monitored to ensure our logs are the very best quality. Certificated moisture testing for optimum burning time and heat output. Delivering top quality logs FREE throughout the local area. FREE stacking service for the elderly & disabled. Free delivery within a 20 mile radius. Please check if you think you might be more than 20 miles away as a small delivery charge may be applicable. 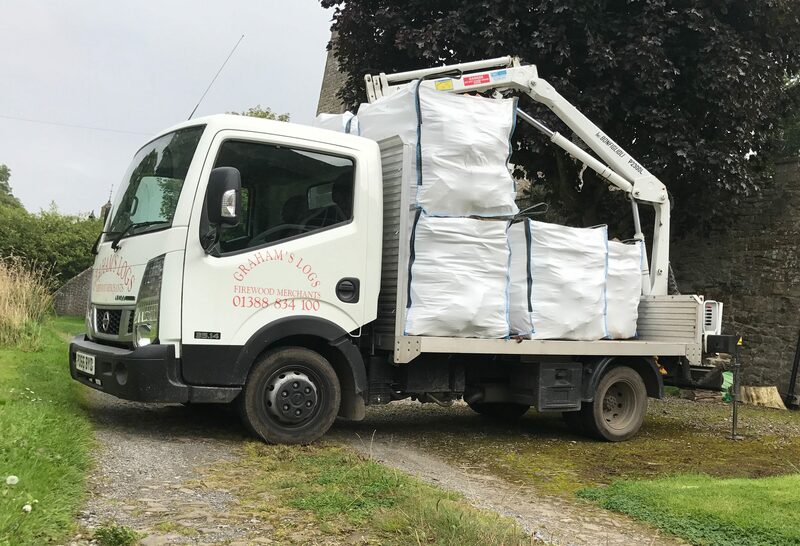 We provide a clean and efficient delivery service with large dumpy bags being delivered from our specially equipped wagons direct to your door. We have 11 years experience and offer FREE advice for your fire or log burner. Prompt delivery or collect yourself available 6 days a week. Our customers come to us primarily through recommendation. We are an independent local business.